X. Bazin ordered private die stamps very early. A die was approved on October 2, 1862, and his plates were ready for printing by January 19, 1863, as that was when Butler & Carpenter wrote to ask what colors and quantities were wanted. A letter in December of that year said that the stamps had been ready for some time but none had been ordered, and asked whether there was an intention to use them. In March of 1864 Butler & Carpenter wrote to the Bureau of Internal Revenue indicating that no stamps had been ordered, and suggesting that the Bureau ask Bazin whether he intended to use them. Indications are that the entire printing of Bazin stamps was destroyed in 1867. However, copies of the two-cent blue are known. 81,360 of these were printed, all on old paper, and some apparently escaped destruction. This copy has part of the end ornaments cut off. 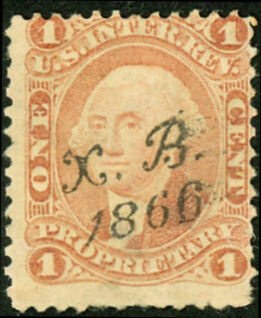 A proof of the one-cent stamp. It is printed on India paper and the end ornaments have been cut off. 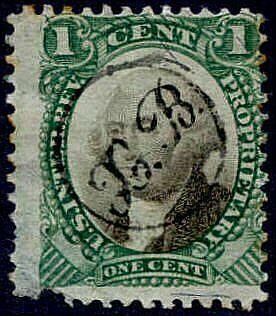 422,400 of the one-cent stamps were printed, but apparently all were destroyed by Butler & Carpenter in 1867. 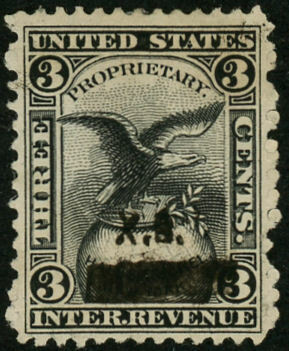 A similar proof of the three-cent stamp. 125,040 of these were printed but not delivered. None are known to have survived destruction in 1867. A trial color card proof of the one-cent stamp, showing the full ornaments at the ends. 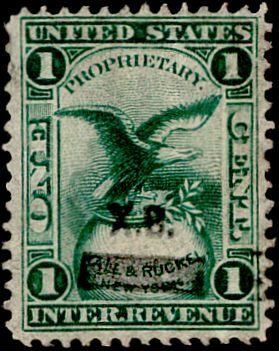 A card proof of the two-cent stamp as printed. Bazin was quite active in the market, as his firm's cancels can be found on general issue proprietary stamps. In 1878 Hall & Ruckel became sole marketing agents for "X. Bazin's Celebrated Toilet Soaps, Shaving Creams, Bandoline, Philocome Pomade, Toilet Waters, Cosmetics, Bulk Extracts, Cologne, Etc." Hall and Ruckel private die stamps were then rubber-stamped to indicate use on X. Bazin products.